WELLINGTON, Ohio — The Wellington FFA chapter received a check from Monsanto for $10,000 Oct. 9. Monsanto’s Mike Yoder presented the check to the chapter. The money will go towards building a new greenhouse for the school. SMITHVILLE, Ohio — Seven Greenhand FFA members from the Smithville FFA chapter attended a leadership conference at Norwayne High School Oct. 5. The members who attended are John Kelbly, Shawn Mantovani, Keri Holmes, Milagro Cantera, Tristen Stoll, Jacob Studer, and Chris Tomic. The students got to meet other greenhand FFA members from local FFA chapters and interact with state FFA officers and past FFA members. 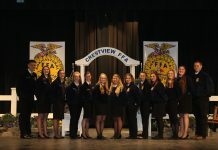 The conference taught new FFA members about career development events, supervised agricultural experience projects, official dress and chapter activities. HANOVERTON, Ohio — The United FFA held a petting zoo at the annual Harvest Festival at Robert Bycroft Oct. 4. The petting zoo was for the clients and their families of the Emplyment Development Incorporation. Animals at the petting zoo included a horse, a goat, a baby pig, sheep, turkey, chicken and a calf. WATERFORD, Ohio — On Sept. 25, the Waterford FFA visited the Statehouse in Columbus to take part in the Ohio Legislative Leadership Conference. The objective of the conference was to allow FFA members to advocate for their agriculture education and FFA programs with their local State Representatives and Senators. With the help of the Ohio Farm Bureau, FFA members learned how to effectively communicate with their state legislatures during the conference. FFA members had the opportunity to enjoy lunch with their representatives located in the statehouse atrium. MILLERSBURG, Ohio — The West Holmes FFA officer team and juniors and seniors helped with the fifth grade farm tour Sept. 25, sponsored by the Holmes County SWCD. The tour was held at the Tom Miller Farm, in Berlin. Members who participated were Clay Armstrong, Jace Freewalt, Morgan Hoxworth, Terry Medley, Wyatt Mellor, Atlee Miller, Tristan Ramseyer, Alex Snow, Chris Sprang, Bryce Williamson, Kayla Bird, Shyann Kick, Lexi Kinstle, Beth Klein, Kara Leadbetter, Grayson Miller, Elise Neville, Dustin Niehaus, Harlie Spurlock, Mandy Taylor, Hannah Schlegel, Jason Jenkins and Paige Miller. Grayson Miller, Paige Miller and Atlee Miller did a presentation on equipment safety. Mandy Taylor, Shyann Kick, Clay Armstrong, Hannah Schlegel and Jason Jenkins did Soil Sams, making edible soil. The FFA is sponsoring a poster contest. The fifth graders can enter a poster on equipment safety. The top three places will be announced at the 4-H recognition banquet and will receive a prize. MINERVA, Ohio — The Minerva FFA participated in the State Forestry Career Development Event Oct. 5. Omri Ciotti placed 104, Bryce Fankauser placed 109, Elizabeth Berstler placed 123, Michael Burton placed 153, Madison Snode placed 156, Bailey Campbell placed 168, Brii Moyer placed 209 and Devynn Plavka placed 216. There were 283 participants in the contest. The entire FFA team placed 22 out of 38 teams.